Along the outer edges of the base and caddy are machined holes. Some of these hold pins that provide a catch for thread, wire and other materials on spools. The pins can be removed from the holes and moved around, allowing for personalized setup. The remaining holes provide storage for bobbins, hackle pliers, scissors and other essential tying tools. Far more important than the existence of these elements is their location. All of the above aspects are located in areas that don’t crowd or impede the tiers hands during the tying process. The importance of that factor cannot be overstated. 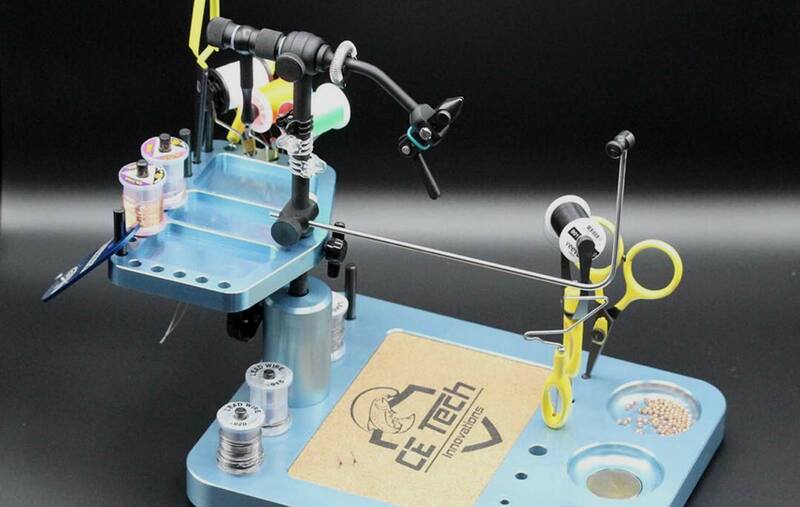 If you’re looking for an exceptional pedestal base for your tying vise, CE Tech Innovations has created it. From the foothills of North Carolina comes a product that will be on my tying table for years to come. The well thought out design and construction of this product will have a positive impact of the tying experience for any and all tiers that put it to use. This entry was posted in Fly Fishing Gear, Fly Tying, The Hot Ticket and tagged A review of the CE Tech Innovations Pedestal Base by Louis Cahill. Bookmark the permalink. Seems a lot of thought is put into most vises, with little to the base and its usefulness. CE Tec gets it!